In order to grow your business, especially a Real Estate Brokerage, you must hire a taskmaster. A Taskmaster is someone who thrives in the ‘Doing’ mode; they naturally look for ‘the next action’ in their tasks. Taskmasters, when working on projects, think in bullet point form and like to get to the end of their projects. If your manager or administrator is not turned on by steps, tasks, and completions with clear end points, then you have not hired the right taskmaster. 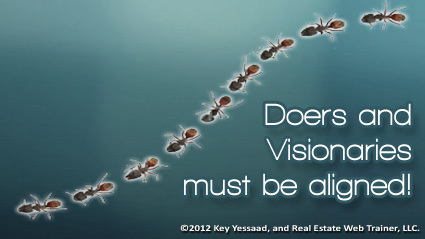 A good Real Estate Business is built upon the vision of its owners and implemented with the help of managers/administrators, and this is why, on a weekly basis, the ‘Visionaries’ and the ‘Doers’ get together so they can align everyone to work in the same direction, with a spirit of cooperation and enthusiasm.